Our school serves as an extension of the Christian home, and we look forward to working alongside you to educate your child. 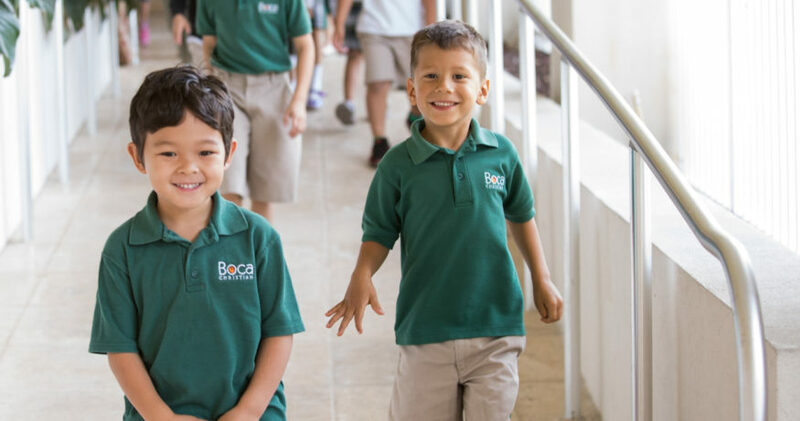 Here’s how to take the first steps to join the Boca Raton Christian School family. ApplyTo begin the application process, simply create an account, then log in and start your online application. You can return any time to complete it. You will also need to submit records from your child's prior school, as well as some required BRCS forms. TestTesting is required of PreK4 – 12th grade students, and will be scheduled after receipt of the application, required documents, and registration fee. Check the Admission Calendar for testing dates. InterviewAn interview is required of all parents before acceptance. An interview is also required of students entering grades 5 through 12. After your application has been processed, the school office will contact you to schedule your interview. Financial assistance is available through Boca Raton Christian School and through Florida’s Step Up for Students program. In order to apply for financial assistance, the student must have applied and been accepted for admission. Boca Raton Christian School admits students of any race, color, national, or ethnic origin to all the rights, privileges, programs and activities generally made available to the students at the school. BRCS strives to provide a solid spiritual and educational foundation for the child’s future. Our goal is to provide a well-rounded, quality Christian education for PreK (3 year olds) through 12th grade.